Can a Man Get Custody If He Files for Divorce? Child custody determinations are made based on the "best interests of the child" standard in all states. Some states, including Tennessee and Arizona, provide specific considerations judges must take into account when determining a child's best interest, while others provide general principles. A man's decision to file for divorce is not a legal factor in determining child custody and both sexes are entitled to custody of their children regardless of who filed for divorce. 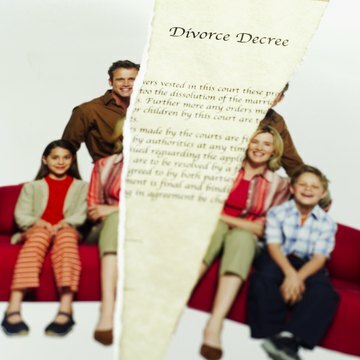 However, the decision to file for divorce can be relevant to a child's best interests in some limited circumstances. State laws vary greatly with regard to factors that are considered in determining what is in a child's best interests. However, all states consider the physical and psychological health of each parent, a child's attachment to her parents, the relative parenting competence of each parent, and the stability of the environment provided by each parent. A man's decision to file for divorce rarely affects any of these factors and the decision to file for divorce cannot, by itself, be used against the filer. Some parents file for divorce and then abandon their children. Men who file for divorce and then do not contact their children for an extended period of time may have trouble getting custody of their children. If, however, a man does not have contact with his children because his ex-wife interferes with visitation, this cannot be used against him. If a man has been prevented from seeing his children for several months or years, the courts may establish a parenting plan that gradually gives the man more time with his children to help re-establish the relationship. While this may seem unfair, it is generally in the best interests of children to avoid complete and sudden upheavals in their lifestyle so gradual transitions may be best in these circumstances. If a man divorces his wife because of his own infidelity, this by itself is insufficient to deprive him of child custody. However, if the man neglected his children because of the affair, this can be used to prove that he was not the primary caretaker and result in reduced parenting time. Similarly, many custody arrangements contain paramour restrictions, which prevent both parents from having lovers in the house overnight when the children are visiting. Judges in most states are permitted to consider the character of frequent visitors to each parents' home. If a man is dating a woman with whom he cheated on his wife, this may be used against him in divorce proceedings. Domestic violence and child abuse are common issues judges deal with in custody proceedings. A man who has abused his wife or children is at a distinct disadvantage in custody proceedings. In many states, there is a presumption that abusers are unfit parents. If, however, a man divorces his wife because of her abuse, his decision to divorce may actually weigh in his favor. Leaving an abusive partner demonstrates an interest in the health, safety and well-being of the children, particularly if the man made efforts to protect the children. Many -- but not all -- states have provisions allowing children, at a particular age, to choose which parent they wish to live with. Usually the age is between 11 and 14. While these preferences are considered more strongly than the preferences of younger children, they are not determinative and judges will not place children with unfit parents. Some children may be angry with their fathers for filing for divorce and choose to live with the mother, while other children may be glad their father left an unfit mother and choose to live with the father. The Scientific Evaluation of Child Custody Decisions; Robert Galatzer-Levy et al. Father's Rights; Jeffery Leving et al.